Said Krugman, "Has lain in stagnation." For medical plans and vacation. 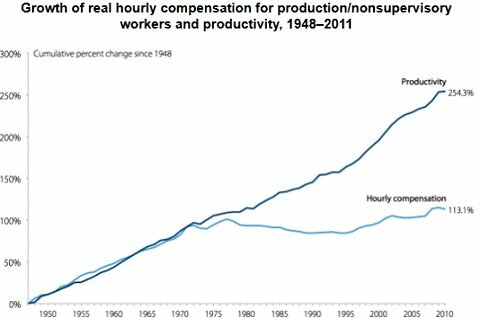 Paul Krugman takes umbrage at those who doubt his assertion that US wages have stagnated since the 1970's (see chart). Yes, Dr. Krugman has thought this through, and the stagnation even takes the cost of health benefits into account, as detailed in this analysis from the Economic Policy Institute. Alarmingly, during the generation-and-a-half in which wages have barely risen, household debt has skyrocketed from 45% of GDP to nearly 100%, culminating in the mortgage meltdown. (Recovery alert: it has since moderated to about 85% of GDP.) The bottom line politically is that this plays into the Presidential choice in November. Mitt Romney has profited greatly from some of the policies and developments that led to the middle class stagnation, and defends them robustly on the campaign trail. Barack Obama, to be fair, does not represent the dramatic reversal of such policies that either he or his critics would have you believe, but he at least acknowledges the problem and proposes some ameliorative steps.